Jacket 12 - PSA Panel - Poetry Criticism: What is it for? Poetry Criticism: What Is It For? 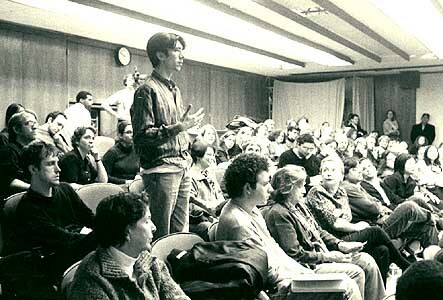 (March 15th, 2000, at Wollman Hall, Cooper Union Engineering Building, 51 Astor Place, New York City) marked the first in a new series of Poetry Society of America panels on contemporary poetics and poetry criticism. Moderated by poet Susan Wheeler, the panel engaged critics Stephen Burt, Marjorie Perloff, Michael Scharf and Helen Vendler in a provocative discussion of poetry criticism today. ‘It’s much easier to be on prize juries, and things like that, where nobody identifies what you’ve said, or to read manuscripts for publishers and so on, but let’s get real — as far as actually putting yourself on the line, which is something that Eliot did and Pound did, and Williams for that matter. . . . I think that until we have poets willing to say what they really think of each other, not about earlier poets but of each other, and really write about each other, I don’t think the discourse will necessarily improve very much." Susan Wheeler: When I was asked to chair this panel, my enthusiasm for hearing these panelists, and for hearing what they would say to each other, overwhelmed my good sense. It was only later, irretractibly involved, that I realized I’d much rather be sitting in one of your seats than in this one. Nonetheless, it is my great privilege to introduce the titans of our tempest, even if some of you may assert that one of our crucial questions is how to jump the rim of the teacup. There is a symmetry to the Poetry Society’s guest speakers tonight. Over twenty years the books of Helen Vendler and Marjorie Perloff have - sometimes both in the same day - provided this reader with extraordinary, heartening readings of poems I have loved and, through their tutelage, come to love. (Of course, ‘loving a poem’ implies a relationship between reader and poem of ‘pleasure’ I suppose, a relationship perhaps deservedly suspect - but we’ll get into that later - ). Their influence upon the careers of poets whom they each admire has been quantifiable, without a lot of crossover between these lists, so they complement each other well tonight. And students - literally or figuratively - of each of them include Michael Scharf and Stephen Burt, young turks who - despite their ages - have already built scenic new routes in the terrain of poetry, inevitable-seeming routes thronged by drivers who find them necessary even while the road crews are still in action. We’ll begin with a brief statement by each panelist. Alphabetically, first up is Stephen Burt. For anyone who has followed poetry criticism over the last 5 years, it seems unimaginable that Stephen Burt is still ABD. His D, or dissertation, on Randall Jarrell, will secure his doctorate at Yale this fall. 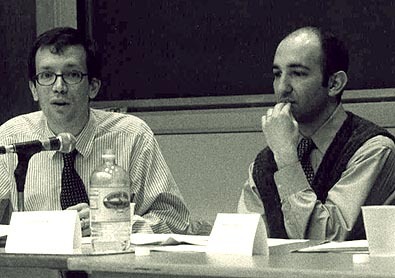 As an undergraduate, he studied with another member of this panel, Helen Vendler, at Harvard, where he wrote on Elizabeth Bishop, Frank O’Hara, and Paul Muldoon, and he spent a year at Oxford, working with the Martian, Craig Raine. His first collection of poetry, Popular Music, just appeared from the center for literary publishing at the University of Colorado, after Jorie Graham selected it for the Colorado Prize for poetry. The venue of another member of this panel, Publisher’s Weekly, called it, a brilliant ‘’take back the night raid’ on what is often called academic poetry." Twice a Mellon Fellow, he has written for TLS, PN Review, Yale Review, Boston Review, Transition, and many other journals on a varied roster of contemporary poets, as well as on Milton, Donne, and Philip Larkin. Taking a group of diverse contemporary poets with the moniker ‘elliptical,’ he has single-handedly been responsible for my hearing, on several spooky occasions, in conferences with graduate students, ‘but I want to be an elliptical poet": Stephen Burt. Susan Wheeler: Marjorie Perloff is the author of over a dozen books on poetry in the last half-century, from the Futurists through what, in technology circles, would be called the cutting edge enterprises of the past decade. And her most recent work-in-progress, Poetry 2000, is a selection in a New Millennium series to be published by Black Sparrow Press. She has been called the best reader of experimental writing there is. Identified most closely with the historical moment of ‘language poetry,’ her work has included studies of a number of individual poets, including essays on D.H. Lawrence, Allen Ginsberg, Dr. Williams, Rimbaud, Mina Loy, John Ashbery, Ingeborg Bachman, and book-length studies of Robert Lowell, Frank O’Hara and William Butler Yeats. Perloff’s interest in poetic culture and in the culture at large - and I am thinking particularly of her book Radical Artifice - has had a profound influence on scores of new poets. ‘Perloff is the first critic to consult,’ Cary Nelson has written, ‘not only because she is an extraordinary close reader, but because her focused polemicism positions and empowers her readers.’ Sadie Dernham Patek Professor of Humanities at Stanford in Berkeley, Marjorie Perloff. Marjorie Perloff: Thank you, Susan. I’m delighted to be here and see so many poet-friends in the audience. Now, I’ll be very informal. The first question we were asked was, ‘What is poetry criticism for?’ That’s a big question, and as I thought about it, I tried to imagine a situation in which there are a lot of people writing poetry but no one ever talks about it. Obviously that would be an untenable situation. First of all, people are going to talk about it, and so you start having criticism, and you have discourse about poetry. My general feeling is that today poetry is in a very healthy state. I think there are wonderful things happening, but I think that poetry discourse itself is pretty terrible, on the whole. I actually blame some poets for this, not just reviewers in the New York Times, because I think we have a situation (and this isn’t often talked about) where the poets don’t want to write about each other. This is true of Language poets too, who in the original L=A=N=G=U=A=G=E magazine wrote about Jackson Mac Low and Gertrude Stein. But they didn’t really write careful essays about each other, in which they really talked about the work. They would throw out comments (many of the articles would be like blurbs) but they weren’t really serious considerations. And that’s true of establishment poets too. Charles Wright once said to me that he never wanted to write book reviews because then you’re on the line - and indeed you are. It’s much easier to be on prize juries, and things like that, where nobody identifies what you’ve said, or to read manuscripts for publishers and so on, but let’s get real - as far as actually putting yourself on the line, which is something that Eliot did and Pound did, and Williams for that matter. I think that until we have poets willing to say what they really think of each other, not about earlier poets but of each other, and really write about each other, I don’t think the discourse will necessarily improve very much. Today you have, on the one hand, a kind of academic discourse that is often dreary, and you have reviewing which, to me, has become almost negligible. The New York Times Book Review: I don’t even read it anymore because I think that the kind of poetry reviewing that you get from the NYTBR is purely hit-or-miss. You might have William Logan nastily reviewing Alice Fulton. And most poets aren’t reviewed at all. The NYTBR has become the review for talking about movie stars and politicians - you know, I read all those reviews about Hillary Clinton and I find them interesting - but as far as reviews of poetry go, they just don’t exist. Now, I don’t blame the Times; we have other newspapers for that, because it’s too hard, given the audience today, to know to whom you’re speaking. To whom is the Times speaking? For whom are they writing these reviews? You can never speak to that many people, and that’s because we have today so many poets. I always think of Yeats’ sentence, in the Autobiography: ‘I had already met all the poets of my generation.’ He probably had. Today, people haven’t even met the New York poets, much less the Seattle poets, or the Cleveland, Ohio poets, foreign poets, and so on. It’s terribly hard to keep up with it all. You remember when the Washington Post decided a number of years ago to stop doing reviews at all because they said thousands of books came in; they didn’t know how to handle them, so they just threw up their hands in despair, and they didn’t review any poetry books. Instead, they put a little poem in a box and put it in the paper. I happen to think that really doesn’t add up to anything very much, but it doesn’t bother me particularly either. It’s just not anything to think about. We need longer articles, more thorough articles, where people are really thinking through issues. Along with that, I think we really need to get away from ‘group-think’ in certain ways. For instance, I’m associated, as Susan just said in the introduction, with the Language poets, but there are a lot of Language poets I don’t think are very interesting at all. This happens with any movement or group, so you have to take it on a case-by-case basis. Speaking personally, my main objection to a lot of the poetry being written today is that nothing is being done with sound and the visual. And even in Stephen’s talk just now I didn’t hear him say one word about sound. To me, the sound of a poem is at least as important as the semantics; so is the visual. Both are aspects of poetry, and I had a terrible experience just the other day when we were judging Mellon fellowships, doctoral fellowships, for the West Coast region in San Francisco. We talked to a young man who had done very well; his whole honors thesis was on Shelley’s ‘Epipsychidion.’ He went on about gender, he talked about masculinity and femininity, and how Shelley wanted to be a mother. But when I asked about the sound structure of the poem, he said ‘what?’ I asked, ‘what’s it written in? Is it written in terza rima?’ and he drew a complete blank. I really did find that quite shocking. Obviously Shelley had a reason for writing the poem as he did, as any poet does, and I think inattention to sound structure has produced the kind of flaccid free verse that a lot of poets use today; it’s not really poetry at all. It’s not that I don’t think it’s good poetry; I don’t think it’s poetry. Jacques Roubaud brought this issue up at a conference I was at in France. He said that he didn’t like a lot of poetry readings these days, because the poet doesn’t give any indication that he or she has come to the end of a line. I knew exactly what he meant: even in the poets that he’s partial to, there’s no sense of line, there’s no reason why these texts are lineated. I guess personally my key principle is Ezra Pound’s principle, ‘Do not retell in mediocre poetry what has already been done in good prose.’ There has to be a reason why something is a poem, and I don’t see it in a lot of the things I see, so I just can’t get very interested in them. The same thing is true of visual poetics. The look of the poem has always been important. It’s not exactly a new thing, and the real revolution of our time is the internet revolution. I know we’ll have some arguments about that. I think it is. You cannot pretend that it hasn’t happened. Whether we like it or not, the internet has changed how things are now read. And I don’t know how many of you have used those wonderful greeting cards. I send them to all my friends. I mean, talk of poetry... but the point is that the look on the page, or on the screen, makes a difference in how something is read, and that is something I look for a lot. Both the aural and the visual. And I think these are things that are terribly downplayed today in a lot of criticism. Why is X poetry? What makes it poetry? That’s one of my big questions. The important thing, then, is to improve the discourse about poetry, and that also means paying attention to what is happening in other countries, which is also something that we’ve neglected. It’s strange that ‘made in the USA’ has become the principle. If it isn’t made in the USA, forget it. And this is especially true with Canadian poetry, Australian poetry, and so forth. I personally think the most interesting poetry written today, or very much of it, is being written in Canada. They have good journals, they do wonderful things. Take a look at the Coach House site and see what marvelous things are on it. Really amazing new things. And I think of Australia, where the magazine Jacket, and all kinds of interesting poetry collections are being published. After all, this is our language. I’m also very interested in what’s going on in Ireland now, and what’s going on in England where, in the last decade, you have a really new poetry. So I think that is a very important thing that I hope we will stress more. Let me talk about some of the problems I see in actual reviewing. There’s a review in this week’s New Republic - I’ll talk about that because it just came out - of Jorie Graham by Adam Kirsch. I thought that was a very interesting review, but I also had some qualms. He’s one of the first people I knew who actually dared to take on Jorie Graham’s poetry, look at it very closely, and say, ‘Why is this line here,’ or ‘what does this word mean?’ ‘what’s it doing there?’ ‘why do we need it?’ But his general point, and this is the part I disagree with, was that difficulty is not a good thing. What he didn’t say is that there are many kinds of difficulty, and there are a lot of other kinds of difficulty besides the kind of difficulty that he was talking about there; there’s difficulty and difficulty. And that leads me to the sense that we have to be more historical, more concerned with the larger picture. This interested me when I worked on Frank O’Hara and it continues to interest me. After all, things do change. And it’s very fascinating to see how things change, whether we like it or not, how they’re just going to change, how the language changes, how the culture changes, even though there are always going to be some constants. So for me poetry is always ‘news that stays news’ as Pound said, it’s ‘language charged with meaning.’ I find that a lot of what’s written is just filler. There’s no better way for me to put it than to paraphrase Wittgenstein: do not forget that a poem, even though it’s published in the language of information, is not used in the language game of giving information. That’s a crucial statement because so much of what passes for poetry, and what’s discussed in poetry reviewing, is just information, and that means that last year’s information is very dull. You get very tired of it. I’m thinking of writing an essay about this, called ‘The Lost Boys.’ In the 60s we had poets like Galway Kinnell, James Wright, Robert Bly. These were the big poets, male poets, of the period. They wrote a certain kind of poem. Then they became unfashionable. If I talk about them to my students, especially in the case of James Wright, who’s dead, they don’t even know who they are: ‘who’s James Wright?’ They were replaced by other people who actually write in a very similar way. They were just younger so they can get away with it. And lately they’ve been replaced by - and I’ll get trampled on for saying this - but I’ll say it, I’ll be brave - they get trampled by minority poets who also write exactly the same way. In other words, if you read a poem by Garrett Hongo, let’s say, it’s not so different from the poems of James Wright a generation ago, but no one reads the earlier poets anymore simply because they’re a generation old. But if it’s always really the same poem, then what’s really the point? It’s not that I believe in any kind of direct progress model, but I do think that poetry has to have something to do with the culture in which it’s being written. It must, and that’s why I have, I guess, a peculiar reaction to a certain kind of nature poetry, let’s say, or poetry that just seems not to take into account how we live today, and what it is we do (‘How to live, what to do’ as Wallace Stevens writes). If you believe in poetic language, if you believe that the limits of my language are the limits of my world (which I do), that poetry is the language art and that you can’t say it any other way, then those things become very important - whether you have a poet who can really present something that could not be said another way, whatever that thing is, and the richer the better. Susan Wheeler: Michael Scharf is the next speaker. I would be hard-pressed to count the times when, over the past few years, I have been asked by both poets and critics if I had seen the astonishing poetry reviews in Publisher’s Weekly of late. ‘Do you know who’s editing it?’ was always the follow-up. The answer is Michael Scharf, who is a contributing editor both at PW, where he edits ‘Poetry Forecasts,’ and at Poets & Writers Magazine where he has inaugurated ‘Metromania,’ a column devoted to current issues in poetry criticism and poetics. Both roles have revealed him to be a passionate observer of the cultural context for poetry and its reception, as well as an acutely intelligent reader of poetry and of poetry criticism. He is also, and equally unbelievably, a doctoral candidate at CUNY. In his first ‘Metromania’ column of the century, he noted that the differences between Marjorie Perloff’s and Helen Vendler’s approaches to poetry have ‘influenced younger reviewers who have begun to publish regularly.’ This criticism has proven both exemplary and prophetic, and extremely up-to-date. Michael Scharf. Susan Wheeler: Helen Vendler is the author of over a dozen books of poetry criticism and, like Marjorie Perloff, has introduced countless others. Although I suspect that many here tonight may have first encountered her reviews in The New Yorker, this ‘author with,’ in Frank Kermode’s words, ‘an almost devout passion for good poems,’ has written for journals such as The Atlantic Monthly, The New Republic, The New York Review of Books, Parnassus, The Yale Review. Her influence on how poetry is read and taught--both inside and outside the academy - is substantial. The focus of her work has been on individual poets, their careers, and their poems. These poets have included A.R. Ammons and Adrienne Rich, Frank Bidart and Louise Glück, Jorie Graham and Seamus Heaney, James Schuyler and Robert Lowell, Wallace Stevens and Frank O’Hara and, recently, William Shakespeare. 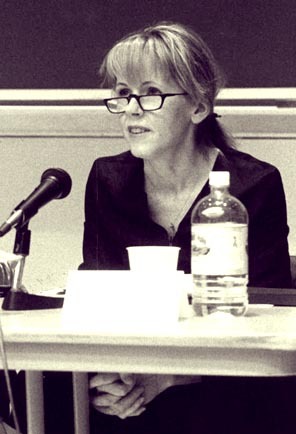 Yet her work has also, on occasion, evidenced the considerable thought she has given to the cultural setting for poetry and its reception, perhaps most notably in her 1990 essay ‘Feminism and Literature,’ but also in her essays on Lionel Trilling, on Keats and the ‘use of poetry,’ on Rita Dove, on Seamus Heaney, and on Donald Davie. A. Kingsley Porter University Professor at Harvard University, Helen Vendler. Helen Vendler: Thank you, Susan. You know, I think that you can best say what reviewing is for, if you say what it did for yourself. When I was twelve I read my first piece of poetry criticism. I’ll never forget that. I didn’t know until then that people could say things about poems. I had books of poems, but I didn’t have books of people saying things about poems, and it was transfixing to me. It was a book by C. Day Lewis called Poetry for You, written for children. It was transfixing because it was talking about poems, but also because it showed various rough drafts, and I didn’t know that poems weren’t born exactly the way they were on the page. The idea that they went through drafts was fascinating. How could they know when to stop? It’s obviously a process that could have gone on indefinitely. Here was a poet writing about poetry, who had the authority of a poet, and not merely - though I didn’t put it to myself that way - of a critic. I was prepared to take poets very seriously, and he showed me a process that I hadn’t dreamed of, a process of drafts. I felt I had learned so much, and had been launched on so many thoughts. Of course, then I began to look for other books about poems. I eventually found Randall Jarrell, who did seem the liveliest critic around, but I also found academic critics. The next phase of learning for me came from many wonderful teachers, but I think of two especially. One spoke about every author he was teaching as though he were the author. You felt that the only thing to do after he had finished talking about Newman was to become a Roman Catholic. On the other hand, if he were talking about Ruskin you thought you had to go to Venice; and after he finished talking about Swinburne, you thought decadence was your thing. It was an entirely sympathetic presentation, in which there was an effacement of the self, and a presentation of a fascinating body of work, where you’re supposed to go with the writer into the houses of flagellation or the houses of prayer. These began to be crucial personal issues for me in teaching. My next view of what poetry criticism could do came when I was taught by I. A. Richards, who put out all the lights. There was a screen, and there was a poem on a screen, and there was Richards standing with his back towards us like a wizard or a druid, with a long wand, his white hair flowing behind him, pointing to single words. There’d be one stanza of ‘Ode on a Grecian Urn,’ or ‘The Ecstasy,’ or some other classic poem, up on the screen, and then Richards would talk about one word. He’d talk about Coleridge and a word like ‘interinanimate’ (which of course none of us had heard before). He would track that word, its roots, its compound uses, its philosophical scope. I didn’t know you could say all that about a single word. It seems to me that that’s another thing poetry criticism can do: make a word come up in letters of gold on the page. When I was writing my dissertation on some really abstruse works by Yeats, my notion, which is still my notion, was that if what I write pleases the poet then what I have done is all right. The poet may be long dead, but the notion is to please the person who wrote the work by making criticism represent fairly what the work had done. And, in that, my model was always George Herbert’s line, ‘If I please Him, I write fine and witty.’ I was thinking, as I wrote my dissertation, that if what I said about A Vision would please Yeats, then I was doing all that could be expected of me. I handed a chapter to my dissertation director, Reuben Brower, and he looked up and frowned at me, and said, ‘Helen, there are other minds.’ Other minds besides this little circuit of me and Yeats, and I thought, ‘Oh, I see; you’re supposed to be thinking about whoever’s going to be reading this thing that you write,’ and until then I hadn’t thought about that. I had thought only about being true to the poet’s work. I learned that you actually have a teacher’s function as a writer. I knew about the teacher’s function in the classroom, but I didn’t know about it when you were writing. Just the very idea that you had a reader, and that that person’s needs had to be taken into account, was another very valuable lesson to me. Of course, the practical difficulties in writing criticism that previous people have mentioned - whether market difficulties, or the difficulties of insufficient space - are valid. For a long time, I was lucky to have sufficient space in The New Yorker with Mr. Shawn to say whatever I wanted about a book without considering anything but the necessities of the review, but that’s a very rare privilege, and I realize now what a privilege it was. Inevitably, reviewing by and large is compressed. It’s just not fair. You can barely sketch themes in 300 words for two books, let alone say anything about the other concerns Marjorie mentioned, of sound or visuality, or the volatility of the page, or influences or connections or contexts, any of those things. Length, certainly with reviews of poetry, seems to be necessary. Poems seem to take up more time to talk about partly because they are so folded in. And to unfold them, to explicate them, is difficult. The troubles we’ve all been talking about - whether the disappearance of the role of poetry or poetry criticism in the larger culture, or the difficulty of finding space in the media, or the difficulty of poets finding a market for their work, or the means to live - seem to me to be a direct response to what happens both in home and at school. Poetry isn’t taught in the schools any more. The audience for poetry is an oedipal one; it’s made in early teen years, from early family experiences, maybe from a librarian who puts you onto something at a young age. Without getting hooked very young I think it’s almost impossible to keep up an adult interest in it. I don’t know why the schools have Xed out poetry but they have. I said to my son’s 5th Grade teacher - after there was no poetry in kindergarten, 1st grade, 2nd grade, 3rd grade, 4th grade, 5th grade - I said ‘Do you ever do any, uh, poetry?’ ‘Oh!’ she said, ‘If I said we were going to do poetry, they would all say ughhhhh." The source of this attitude is not the children. They would be glad for anything anybody could entertain them with; but the problem is that many of the teachers themselves are not intimate with poetry. And even if a poet-in-the-schools goes in for one day every two weeks, this is not going to change the culture of the classroom. It would have to be the teachers themselves who would be intimately acquainted with poetry. Until things change in the schools, I don’t think there will be a way of building an audience, any more than there is a way of building an audience for classical music. Everybody’s concerned about the geriatric nature of symphony audiences - that’s because schools have cut off training in music. Instead of every child having consistent singing practice, choral singing practice, instrument learning, and perhaps band, this has gone by the board. I would like to see schools helping children to grow up musical and poetical, but I don’t know what we can do to make that happen. I would like to come back to the question of poetry and cultural context. I don’t, myself, think that I have ever connected with contexts in any way. I was a bookworm. I was in the library. I was in my bedroom. I was in my study. I am not interested in groups. I have never joined a political party. I have never voted. I have never registered to vote. I have never gone to a church. I have never belonged to a club. I’ve never belonged to anything. So contexts are, for me, in some ways, deeply spectral. They don’t seem to exist, and that is the deficiency of the kind of criticism I do, and is probably its virtue as well. We all know the defects of our virtues. I think there’s room for many kinds of criticism. There’s room for criticism engaged in my circuit with the author, and there’s room for criticism that says what the role of poetry is in the larger culture. ‘The most marvelous bishops of heaven,’ says Stevens, ‘are those that made it seem like heaven.’ And the most marvelous bishops of poetry are those that made it seem so. It’s rare to find that volatility and power on the page, as we all know, and we’re all looking for it all the time. The fact that there are people who are recognizingpoetry, whether east-coast, west-coast, south, or north, seems to me a wonderful thing. It’s very nice to be handing over one’s own function as a talent scout to the next generation. Susan Wheeler: Thank you all. As you have indicated, many of the constraints on contemporary reviewing and contemporary poetry criticism are products of market forces right now. In light of that, I wanted to begin by asking you, what part of your practice works against these forces, or do you work with them? For example, to work within the constraints, a very brief review may not be seen as necessarily constraining. Perloff: Gide turned down Proust. In other words, ever since the modern age, if you want to begin with the Enlightenment for that matter, it has been the case that the response to any kind of new and difficult art has been negative. Proust was reviled, so were most writers, so were artists. I don’t think it’s a contemporary situation. Burt: You were talking about when Yeats said ‘I knew all the poets’ but Yeats also says in that same autobiography, ‘The only thing certain about us is that we are too many.’ One wonders why people who have a reaction to contemporary poetry aren’t immersed in the poetry of the past. Why they don’t go home and read Blake’s long poems all the time, as Jarrell said in the Fifties. I don’t know what can be done about reviews other than triage, decide what the most important people do, in how many words you have. Scharf: The biggest problem for me is that there’s a lack of a shorthand for talking about the work that I want to talk about, so it’s incredibly hard for me to review. If I want to review Roderigo Toscano’s book, and to talk about how that book works and what it does, what the assumptions and reading are behind that book, you have to tell people what they are. That’s what I’m trying to do with the Poets & Writers pieces. It just seems that 25 years of literary history has just been sort of erased, contrary to all of Marjorie’s best efforts. So, that’s the biggest problem. Vendler: I would just like to say that we are in a difficult situation in this country. After all, the kind of literary culture that grew up in Europe always had a single focal city, maybe two at most. There might have been Edinburgh as well as London but most writers got to London or Paris or Budapest or wherever it might have been, and they did all know each other. Those capitals were small enough. Burt: Or they cover them badly. Vendler: Or they cover them badly. Perloff: Well, can I say two things about that? First of all, I don’t believe it’s any better in France. In fact, I know it isn’t. The French poets complain all the time: there’s very few magazines, there’s very little reviewing going on. And I think that’s pretty much true in Japan, where I recently read, and around the world. I don’t know if we can do anything about that. But one answer to this is to look at the old little magazines. If you go back and read the early avant-garde magazines, Others and even The Little Review, The Egoist, they have a lively poetry culture that can teach us something. If people are willing to put themselves on the line perhaps a little bit more, then things would get livelier. Take Kenneth Rexroth for instance, both as poet and critic. Rexroth would write some sweeping thing about something in one of these early magazines, just wonderful articles, and in general when I read these early magazines I’m almost mesmerized by the wonderful, exciting writing that went on, and the great arguments, even if you disagree completely with them. He was sometimes trashing Milton or trashing a lot of his friends, but there was a sense of being willing to say what really mattered. And now I think we’ve become much too polite in a certain way, and so I’ll go back to what Steve said and start a little argument (we might as well, right?). Steve said in his talk, ‘I like Rae Armantrout, I like Frank Bidart, I like so-and-so.’ I find myself asking, ‘Why?’ I don’t know what that means to like some of those people you listed. I think it’s too tolerant. Great art and great criticism have never been tolerant. Was Milton tolerant? Was Goethe tolerant? It’s not up to artists and in that case their critics to say ‘Gee, everything, is great. I like this, and I also like that. And how wonderful that is." Perloff: They’re not reviewing each other. Scharf: Yes, they are. In Shark and Lingo and Aerial and Jacket. Perloff: Have you ever seen a bad review in one of those journals? Scharf: Yeah! Sure. Standard Schaefer’s chastising of Brian Kim Stefans’ Free Space Comix for its language-poetry pedigree, which sent shock waves through the community. I think the problem is the stuff doesn’t get out of the community into the more widely read venues. The problem is there is no generalized language for getting that out of that community. Burt: There are several networks of journals where poets are reviewing, negatively reviewing each other. You mentioned one in America. A very good Irish magazine, called Metre, publishes a lot of negative reviews that are very articulate attempts to give readers critical dogma. There are several others, but I think you’re calling for more negative reviewing..
Perloff: No, I’m not. When you say Brian Stefans and Standard Schaefer - I don’t know how many people in this room know who Brian Stefans or Standard Schaefer are? Can we see hands? I’m saying that for instance Charles Bernstein should write a review of Seamus Heaney, and really deal with issues — not just say, ‘well, that is them, and this is us.’ And vice versa. In other words what difference does it make that Brian Stefans takes on Standard Schaefer because - let’s get real - most people haven’t heard of either one of them. Perloff: But there you go: What we have to really talk about is what our assumptions are..
Susan Wheeler: Marjorie, you argued in another essay that asking poets to review other poets is like asking architects to write on the architecture of their peers. Is this a shift? Perloff: No, it isn’t. In my book, Poetry On and Off the Page, I was talking about something very specific. Namely that the TLS assigned Glyn Maxwell, a poet who didn’t have the slightest sympathy for Charles Bernstein, to a number of experimental poetry books, together with Richard Poirier’s latest book, and something else, and it was a foregone conclusion that he wouldn’t like them. So the tone was quite snide, and he didn’t even know what he was talking about. He obviously hadn’t read the books that he was reviewing, and I thought ‘Why was he assigned to do it?’ Well, he was assigned because he is a poet and for no other reason. So it does sound as if I’m contradicting myself, but the point is that the reviewer has to be somebody who will at least give the work enough sympathy, or enough interest, to make it worthwhile. The reviewer needs to understand what the donnée of the other poet is. To be totally dismissive doesn’t do any good. You would have to really take a poet’s work on, which means, you’d have to really put yourself, as Helen said, in that poet’s place. You have to ask yourself not only what the poet is trying to do, and how you would feel about it, but what are the assumptions underlying it. So to have Glyn Maxwell, in the TLS, review those particular books was just ridiculous. Why was he chosen? Well, because we want to assign poetry reviews to poets. Well, yes, but to assign a book to someone who’s already made up his mind that he can’t stand the stuff really seems a little unfair. Vendler: I’m often asked why I don’t often do negative reviews. Sometimes I’ve promised to write something and it turns out to be a negative review, but basically I don’t want to write about that which doesn’t attract me on the page - it’s very much like being asked to talk about an incompetent singer. All you can say is the voice has no carrying power, there’s no interpretative ability, there’s no resonance or timbre, no dramatic excitement. All you can say is things that you miss; that doesn’t seem to me an interesting kind of writing to do, I mean life is too short. It’s like doing a multiple choice test: timbre, NO; carrying power, NO; interpretative talent, NO; this is just a boring kind of writing to do, whereas when something seems to be succeeding on the page, it’s thrilling - and especially when it’s something new and you don’t know how the poet is making it happen. There’s nothing more interesting to me, whether in an old poet or a new poet, than figuring out why something has come alive, why somebody has been able to take a blank piece of paper and make something excitingly volatile and surprising all the time, where you don’t know what is going to happen next. I do think that when you turn to, say, the criticism written by Eliot, it just didn’t matter whether he was writing about A Game of Chess or Milton or Donne or anybody else, he was really writing about the kind of poetry he wanted to write himself. His essay was a manifesto for the poetry that he himself was sponsoring at the time. Susan Wheeler: Given that a couple of you are poets, and a couple are not, I’d be interested in hearing about specific examples of times that you set yourself tasks to write against your own sensibilities? Perloff: I wrote on Laura Riding, and Laura Riding is somebody I have no particular interest in. You don’t want to spend so much time on somebody who you don’t really like much, but it is interesting in that you learn certain things. I don’t write that many negative reviews now at all. Let’s come back to something Michael said, something about how ‘we should have ideas instead of just preferences.’ I’m not quite sure what you mean by preferences. I guess what I would ask for is knowledge. I have just written a piece that’s going to come out pretty soon in American Book Review on The New Outlaw Bible of American Poetry. It’s an astonishing book, and it has some good things in it, but also some very strange ones. It’s an interesting phenomenon. There are all kinds of reasons to write about something. This happens to be a 700-page book that claims to be all by outlaws, all by people who are totally marginalized. It makes me think of that line in Beyond the Fringe where Peter Cook says, ‘A few brave men asked to join in the noble fray. A young man says: ’Please, sir, can I join the few?’ ’There are already too many,’ the captain barks.’ That’s what I mean about the Outlaw Bible of American Poetry. There are all kinds of reasons to discuss something and it doesn’t need to be all positive, or negative. I was not trying to make a case for negative reviewing, because as time goes on I do less of it too, and here’s something else we might talk about, which one hates to admit but which is true: the older you become the fewer negative reviews you write. I really think this is true. Robert Pinsky said this to me once: ‘Once you know the people, you feel terrible attacking them." Really, reviewing is a young person’s sport. 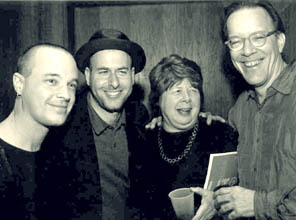 When you’re older you know these people, you’ve met them.... I’ve written negative things, for instance, about Philip Levine. I wrote something very negative about Levine in Radical Artifice, but that’s because I never met him. If I had met him, I might never had done it, because you just feel too awful when you know the person - you might even like him! So that is the way it works. Scharf: Obviously, for PW, I hide behind the anonymity of the unsigned reviews, and we have to review every day. I have to write about books I don’t much like - a good example is this book by Ruth Stone that just won the National Book Critics Circle Award, which is not my thing at all: when I read it, I thought ’well, this is a really good example of this kind of stuff’ and I couldn’t find anybody to review the book and I reviewed it myself and it was a very positive review. For what the book was trying to do, it did it extremely well, I thought. It was actually engaged with things that I usually look for in poems using more difficult language, but at least it did talk about them so I thought ‘great’ and that was a nice surprise for me. I don’t know if Helen Vendler feels the same way, but sometimes when I have been asked to review something that I don’t choose to, I find that I learn something. Vendler: I wrote about Laura Riding too. Perloff: Yes, we’ve all written about Laura Riding. Vendler: And I’ve done things like write about the Collected Poems of e.e.cummings, which is a very uneven book. When you write about a big book, whether it’s the Collected Poems of cummings or the collected poems of someone else, you’re freer. If you think that this person has done something original, you can talk about his best work, but also about what didn’t get done well, and that way you can write a balanced review showing the value of the work as a whole. But when you’re doing a single volume, you don’t really have a way of balancing this against that. Burt: That’s not a negative review unless someone wants to perceive it as that. Vendler: When I think of poets who write manifestos, I think of one that Mary Karr wrote against James Merrill. [See footnote.] I don’t know if you know that essay (Mary Karr’s Afterword, ‘Against Decoration’, in Viper Rum)... She was staking a claim against a kind of poetry that she thought was over-decorative, precious. There are essays like that, or the one that was mentioned by Louise Glück, which was a polemical manifesto-essay against the kind of poetry she was taking on. Adam Kirsch’s review which was just mentioned seems to me to be an example of the critic conducting his education in public; I helped to educate Adam, so I’m glad he’s continuing his education, but I think that his review doesn’t tell us much about the book. When I read a review I want to ask, ‘What kind of book is this, what kind of intervention is it making?" There are also various other kinds of critics, the critic as agent provocateur etc. There are lots of ways of being an interesting critic. Criticism is a form of self-expression for people who are not poets themselves but who feel strongly about poetry. Burt: Can I have the microphone here? I don’t want to interrupt, but I wanted to get back maybe from there to the question of: under what circumstances can we as reviewers and as critics, as practical critics, talk about how a volume appears to us and then try to get you, the readers, to read it that way? I, we, think that the poems wish to be read, and that involves certainly a lot more attention to sound and structure than you ordinarily see in reviewing, and the chief reason for that is because so many reviews have to be 800 words or a thousand words, and as I think everyone here has said, we barely have time for the review. Burt: But I guess what I’m saying is that there aren’t enough. I would love to talk to all of you for about half an hour about how Ashbery sounds, but probably most of you wouldn’t be here because this is a cultural forum. Scharf: What about the Journal of Philology or something like that? I mean there are plenty of journals where you can do that kind of thing. I don’t see how talking about formal stuff is really crucial to journalism, so you seem to be saying that the TLS, which is something that 100,000 people see, doesn’t do this. Burt: I’m speaking not just about aural devices (and I don’t know if the Journal of English Philology wants an article about that today or not, I haven’t checked), but about the formal vocabulary for dealing with anyone who is interesting and innovative, and that’s to some extent what you were calling for too: some way of getting the language out there through which to talk about various poetries. You want to articulate and make more public the formal vocabulary for saying why you like particular writing. Scharf: But what I was saying was that a language for discussing innovative poetry and poetics is being developed in journals where people talk to each other, and that the next step is for journalism to develop a shorthand. I think the language is starting to fall into place; it hasn’t altogether done so even for the language poets. You know, there’s still tons of work to be done. But somehow there’s been this break: people don’t talk to each other anymore, so the people who are interested in journalism don’t follow what’s going on in the poetry journals, and the language for getting from those journals to the VLS doesn’t exist. Perloff: Let me say something positive, since everybody’s saying so many negative things. One person who’s really tried very hard to bridge some of these gaps is John Kinsella, who some of you know, who edits the magazine Salt, the Australian one, and Stand. He really has tried to bring people together. He is responsible for some good reviewing. For instance in the most recent issue he had Brian Henry review Charles Bernstein’s My Way. Now, Brian Henry’s the editor of Verse, and he’s certainly not a language poet. He’s sympathetic in certain ways, and there are connections. I thought that was a very interesting article, and it interested me to see that Brian Henry took it seriously. So it can be done, and I think Herb Leibowitz does it in Parnassus. Brian Henry was a good choice because he was sympathetic without being part of that group. That works, and it can work in other ways too. Burt: We’re seeing how much depends on the choices made by editors, and what sort of choices editors assign books for review to reviewers - say, ‘I need 500 words by Wednesday’ or ‘take all the space you want, you have until May." Scharf: I just think it’s too easy for people to be poets without dealing with the whole spectrum of what’s happening in poetry now. I think that was the point of my paper. Katy Lederer: I raised my hand because my question is just based on what Mike just said. It seems to me that many practitioners of the avant-garde went to an MFA program. Do you not agree with that? Scharf: 2 or 3 of them, out of the 200 programs that are in the country. Burt: I have this list here in my hand. Scharf: Well, it seems that when people go to MFA programs they, for the most part, 80% of them, they learn a version of ellipticism. If it’s experimental it’s a version of what Steve calls ellipticism where it’s still the self and still lyric. That’s sort of the credentialized, professionalized version of what’s out there now and that’s what journalism follows instead of looking at what’s going on under the radar. Lederer: So maybe you could just talk more about where you think these independent communities are coming from? Are the poets all coming from cities? Scharf: No, some go to Brown, or Iowa I guess. Susan Wheeler: One of the things that we’re trying to bridge here was that divide between the theory aspect of literature departments and MFA programs. Vernon Shetley has advocated difficulty in his After the Death of Poetry because it is that lack of difficulty which has made a general intellectual audience like New York Review of Books readers be fairly dispassionate about contemporary poetry, and desert it for theory. William Louis-Dreyfus: I wanted to ask Marjorie Perloff about her comment about book reviewing. I’m wondering why people had assumed that there isn’t any difference between the work and the person doing it? Why is it such a battle to criticize the poem without taking on the ire of the poet? And vice versa? Perloff: Well, it shouldn’t be. And maybe in the best of all possible worlds, it wouldn’t be, but it isn’t just criticizing a poem. You’re usually criticizing a book of poems. You know it’s somebody’s lifeblood and sweat and if you are demolishing it, or being very critical of it, that’s devastating. None of us like being devastated in that way. I published a piece in the Georgia Review called The Linear Fallacy: I commented that just saying something in lines doesn’t make it poetry, and I was very critical of Robert Pinsky. He wrote me a very nice letter - this is how you neutralize people - saying ‘I agree with you. In that book, Explanation of America, I don’t think the lines really work, but I’m now writing something really different.’ And then he came to L.A., and I met him. I had lunch with him. I thought he was very charming, and as a result I’ve never written about him again because I couldn’t write about him positively, but I wasn’t going to write about him negatively, because he is so nice. Louis-Dreyfus: This attitude doesn’t advance poetry criticism, as far as I know. If anything it detracts from it. Wheeler: There is a small journal, called Countermeasures, out of Santa Fe, which has undertaken the project of soliciting and publishing a diverse group of poets’ responses to diverse poems, inviting comments by poets with disparate sensibilities on poems they might have otherwise overlooked or dismissed. Vendler: Even if contemporaries don’t write about the poet in question, someone comes along after, say, e.e. cummings is dead, and writes about the Collected Poems of e.e. cummings - after nobody’s feelings can be hurt. After I wrote my very first review for Mr. Shawn, he called me up and said, ‘I think everything you said was fine and true, everything you said was very well-said, but I’m not going to print the piece because I think the widow would be hurt.’ I respected Mr. Shawn’s delicacy. Burt: These considerations are why some of the best critics we’ve had, some of the best critic-poets, chose almost never to write about living people. William Empson reviewed Stevens once, and a handful of other people, but Empson chose very deliberately not to feature people who were still alive as the subjects of his major articles. I think because he didn’t want to get into these situations. Can anyone think of exceptions? Burt. Well, no, no, no. Jarrell is more typical than Empson in that he was a good critic who did want to write about living people. Wheeler: And he is remembered as one of the liveliest... because he did engage his peers. Stephen Burt: The values that I hold are my values. And we can start talking about this in a very deep debate about philosophy. Can you have values unless you get beyond your values? And how do you know what your values actually are unless you do? When you start having those debates, it can be very interesting, but you are no longer talking about why you like or don’t like specific poems, and what value you find in the poems, and I think I’m more useful in talking about specific poems, and why I like them. Wheeler: But I think that part of the question was ‘is there a historical model for your own preferences?" Burt: You mean, is there a dead critic I wish to be like? There are several dead critics I wish to be like. The issue is for all of us to construct out of bits and pieces like Dr. Frankenstein’s monster. Wheeler: But what’s your relationship to a historical view of criticism and to this moment in culture? Burt: I’m perfectly willing to talk about what I think is happening at this historical moment in culture now if I have to do so. I hope it’s interesting, and I think part of having this forum is that we’re being asked to talk about what is happening at this moment in culture, and that’s interesting. I would rather talk about individual poets and poems. I don’t know if that’s an answer. Perloff: I just wanted to say that there are different reading communities. This is something that we haven’t stressed enough, and this goes back to what Mike said. It is incredible what he’s done: to take something like Publishers Weekly, a market magazine, and actually succeed in doing for the community, this is a wonder to behold. I’d like to call attention to the Boston Review, which has those little mini-reviews. The purpose of those, as far as the reader goes, and I’m glad you bought the reader up, is just to call things to your attention, in a short, interesting way. When I wrote my Frank O’Hara book my aim was really to interest people who hadn’t liked Frank O’Hara - at that time most people totally dismissed O’Hara. The book came out in ’77 and I still remember the TLS review that said ‘Well, she’s trying to say he’s an important poet, but we all know, he’s not; he’s totally minor.’ Since then, that attitude has really changed. Alissa Quart: Well, I really liked what Steve said about ‘the pathos of not having an epistemology." Quart: And I think the reader of criticism shares in that pathos, and one of the things that is missing from poetry reviews is the excitement of the art world. The problem is simply one of not having a market. People who read art criticism today want to buy paintings, but they’re also getting something of visual value, so I guess the question is, ‘how can we produce for readers a market value of information, epistemology, glamour, from poetry?" Burt: Do we want the poetry world to look more like the art market? Scharf: Well, if it’s the only way that we’re going to get money into it, yes! Vendler: I think every generation of students sits mutinously in the classroom thinking, ‘Why don’t they ever talk about X?’ I was always sitting there when they were talking about the English Civil War thinking ‘But why don’t they ever talk about Paradise Lost?’ and the next generation is sitting there while someone is talking about Paradise Lost thinking ‘But why aren’t they talking about the Civil War?’ You can’t please all the students all the time, but there are generational oedipal conflicts, so I assume there are mutinous students now too. One idea of scholarly criticism is probably to get revenge on the teachers you had who never mentioned the aspects that you wanted to hear about. Scholarly criticism aims to right a balance, and some of its passion comes from saying ‘Well if nobody else will say it, I will say it." Perloff: I also think that scholarly criticism has the function of placing something and giving you knowledge, and that’s why I was talking about knowledge before. I don’t want to beat up on that review of Graham in The New Republic because I thought on the whole it was very interesting: a long, detailed, review, where Adam Kirsch talks so much about difficulty. I thought it was not a very informed review. He should know that difficulty is hardly news. What was 19th century French poetry like? What is most poetry like? It’s difficult. The same thing happened when I was first writing on Frank O’Hara, and looked at all the past reviews, many of which were bad. It was only later when I realized that many of those were quite homophobic, because they’d say things like, ‘The poems are really like streamers floating in the breeze’ and so on. People would say ‘Well, that’s not really poetry at all’ if they were used to Allen Tate, or for that matter, Robert Lowell and the New Critics. Again, scholarly criticism takes you back to something and shows you that there are plenty of traditions for new work. I think that’s incredibly useful. And then you can also see a lot of things that you wouldn’t see otherwise, so that new things don’t seem so aberrant. So that I think that our discourse about ‘language’ poetry, which is a word that the poets themselves don’t use much anymore and that I don’t like to use, is so bad that you’ll hear things like ‘I don’t like language poetry’ or ‘I do like language poetry" - it’s just a ridiculous kind of discussion. What are we really talking about? What’s behind it? Where does it come from? How do you place it? How does it relate to the objectivists? How does it relate to Gertrude Stein? One of the things I’ve been discovering lately is that, although somebody like, say, Bernstein will say ‘They ALL say they come out of Gertrude Stein - ‘ but they don’t. They may love Gertrude Stein, but there’s the anxiety of influence, so that somebody like Bernstein may be much closer to the early T.S. Eliot. That’s my latest theory. Susan Wheeler: I think that we’re out of time. I’d like to thank you all, and especially thanks to all the panelists. Jacket magazine wishes to thank Caroline Crumpacker and the Poetry Society of America, who kindly provided edited transcripts of the procedings, and to Stephen Burt, Christina Davis, Marjorie Perloff, Michael Scharf, Helen Vendler, Susan Wheeler and Rebecca Wolff. Copyright details below. Footnote: Helen Vendler wishes to correct a spoken mistake made during this panel discussion.The transcription shows Helen Vendler naming Alice Fulton in place of Mary Karr. As transcribed the statement read: “When I think of poets who write manifestos, I think of one that Alice Fulton wrote against James Merrill. I don’t know if you know that essay...She was staking a claim against a kind of poetry that she thought was over-decorative, precious.” In fact, the essay to which Helen Vendler was referring was Mary Karr’s Afterword, “Against Decoration,” in Viper Rum. Professor Vendler wishes to apologize to Alice Fulton for mistakenly naming her instead of Mary Karr as the author of this essay, and is heartily sorry to have misled not only the panel audience but also the readers of the web-sites of the Poetry Society of America and of Jacket magazine.